This article is about the scholarly institution. For other uses, see Academia (disambiguation). "Academic" redirects here. For other uses, see Academic (disambiguation). For a topical guide to this subject, see Outline of academia. "Academe" redirects here. It is not to be confused with Academi or Academy. Academia is the internationally recognized establishment of professional scholars and students, usually centered on colleges and universities, who are engaged in higher education and research. The word comes from the akademeia in ancient Greece, which derives from the Athenian hero, Akademos. Outside the city walls of Athens, the gymnasium was made famous by Plato as a center of learning. The sacred space, dedicated to the goddess of wisdom, Athena, had formerly been an olive grove, hence the expression "the groves of Academe." Taxila or Takshashila, in ancient India, modern-day Pakistan, was an early Buddhist centre of learning, near present-day Islamabad in the city of Taxila. 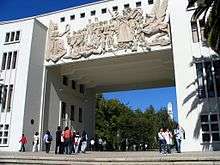 It is considered as one of the ancient universities of the world. According to scattered references which were only fixed a millennium later it may have dated back to at least the 5th century BC. 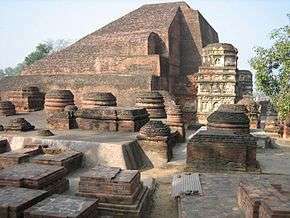 Some scholars date Takshashila's existence back to the 6th century BC. The school consisted of several monasteries without large dormitories or lecture halls where the religious instruction was most likely still provided on an individualistic basis. Takshashila is described in some detail in later Jātaka tales, written in Sri Lanka around the 5th century AD. The most notable of these new schools were in Bologna, Paris, Oxford and Cambridge, while others were opened throughout Europe. The Academy movement in the U.S. in the early 19th century arose from a public sense that education in the classic disciplines needed to be extended into the new territories and states that were being formed in the Old Northwest, in western New York State, Pennsylvania, Ohio, Michigan, Indiana and Illinois. Dozens of academies were founded in the area, supported by private donations. In the United States, the term academic is approximately synonymous with that of the job title professor although in recent decades a growing number of institutions include librarians in the category of "academic staff." In the United Kingdom, various titles of academic rank are used, typically research associate, research fellow (also senior research fellow and principal research fellow), lecturer (also senior lecturer and principal lecturer), reader, and professor. The colloquial term don is sometimes substituted for teaching staff at Oxford and Cambridge. Academia is usually conceived of as divided into disciplines or fields of study. These have their roots in the subjects of the medieval trivium and quadrivium, which provided the model for scholastic thought in the first universities in medieval Europe. The disciplines have been much revised, and many new disciplines have become more specialized, researching smaller and smaller areas. Because of this, interdisciplinary research is often prized in today's academy, though it can also be made difficult both by practical matters of administration and funding and by differing research methods of different disciplines. In fact, many new fields of study have initially been conceived as interdisciplinary, and later become specialized disciplines in their own right - a recent example is cognitive science. Within academia, diverse constituent groups have diverse, and sometimes conflicting, goals. In the contemporary academy several of these conflicts are widely distributed and common. A salient example of conflict is that between the goal to improve teaching quality and the goal to reduce costs. The conflicting goals of professional education programs and general education advocates currently are playing out in the negotiation over accreditation standards. The goals of research for profit and for the sake of knowledge often conflict to some degree. ↑ "History of Education", Encyclopædia Britannica, 2007. ↑ Radhakumud Mookerji (1941; 1960; reprint 1989). Chandragupta Maurya and His Times (p. 17). Motilal Banarsidass Publ. ISBN 81-208-0405-8. 1 2 Radha Kumud Mookerji (2nd ed. 1951; reprint 1989). Ancient Indian Education: Brahmanical and Buddhist (p. 478-489). Motilal Banarsidass Publ. ISBN 81-208-0423-6. ↑ Altekar, Anant Sadashiv (1965). Education in Ancient India, Sixth, Varanasi: Nand Kishore & Bros.
↑ "Really Old School," Garten, Jeffrey E. New York Times, 9 December 2006. ↑ "Six-Year Specialist Degrees". Archived from the original on 6 December 2006. Retrieved 2006-12-03.